Kick Him To The Curb: I Lie. I Steal. I Sell Drugs. I Don't Follow The Law. What does a mother do when her son consistently gets into trouble and all he gets is a slap on the wrist from the courts? She does whatever she can to help guide him in a better direction. That meant for one Indiana teen, it was to the curb he went. 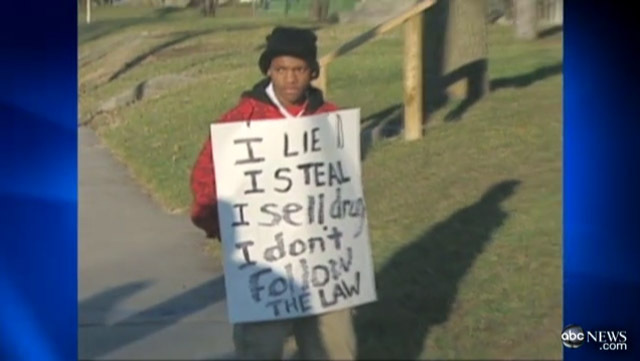 Dyneisha Black, an Indiana mom was so fed up with her 14-year-old son breaking the law, and only receiving community service for his crimes, she forced him to stand on the sidewalk for two hours in front of passing vehicles, wearing a sign that read: I Lie. I Steal. I Sell Drugs. I Don't Follow The Law. “What more can I do,” she asked. While ABC News hyped up the story by saying the mom was in “hot water” for her “unorthodox punishment,” that's not true. According to police, she was within her right to embarrass him by making him stand outside and tell the truth. Are you mad?